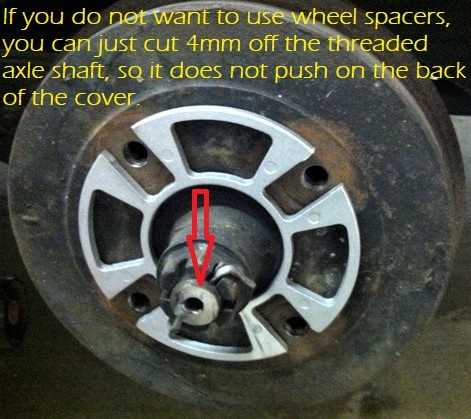 MG Replicas with 4 lug VW wheels require "Wheel Spacers" to clear rear axle shaft. Some 5 Lug VW Wheels need "Wheel Spacers" to clear the front center Hub. The threaded axle shaft will not allow the Wheel Cover to seat properly on the wheel. Remove the Lug nuts; remove the wheel from the brake drum. 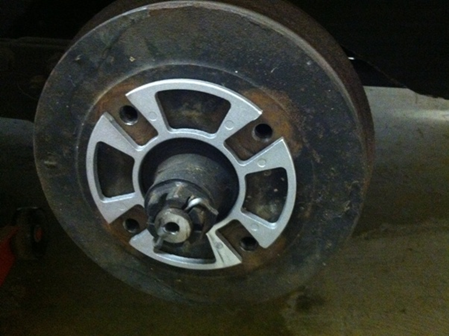 Install the Wheel Spacer (as shown below); re-install the wheel and lug nuts. In some cases you may need longer lug nuts to secure the wheel properly. Click the button below to add the Wheel, Covers, MG Replica (Chrome) Spoke ABS (Each) to your wish list.